TD Play Continues to Support Burnaby Striders! Thank you to TD Bank for their TD Play community program. 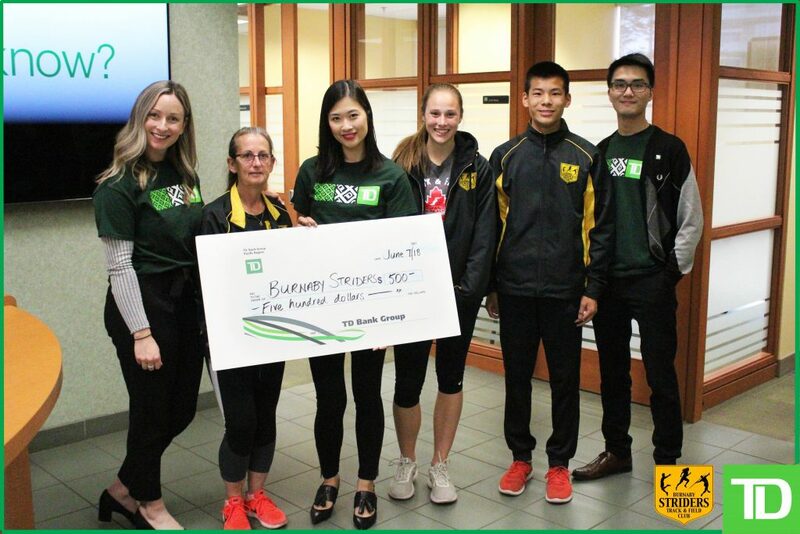 We’d like to extend our deepest appreciation to Joanne Leung, Branch Manager, and her team at the Burnaby Center branch at 1933 Willingdon Ave for generously donating $500 to the Burnaby Striders Track & Field Club! Every contribution is important and it goes a long way in helping us continue our support of young athletes to train, develop and compete at all levels of the sport. Burnaby Striders is a non-profit society, so generous donations like these are instrumental in us being able to deliver ongoing coaching, best-in-class facilities and updated equipment to our athletes, so that they have everything they need to achieve their goals & dreams! Thank you again, Joanne and TD, for your commitment to the community and it’s people! Fraser Valley & South Surrey – Juniors Step Up! As we are in full swing with weekly meets, our Juniors continue to shine at the local meets, with ones held in Maple Ridge & South Surrey. Strong performances in the 300 meter dash, with Ava Jackson, Marisa Mazziotti & Alec Brent all capturing hardware. And Joe Georgilas securing 1st in the 100 meter and 2nd in the long jump. Our relay teams had a strong performance as well to finish off the day! Out at the Junior Olympics track in Surrey, Ava finished in podium position for both the 200 meter and long jump. Brendan Lim, Max Mazziotti & Rachel Roberts all had solid showings to round out the Striders Junior team these past 2 weekends. Way to represent! Fundraising & Support for Burnaby Striders! And it’s easy to use! All you have to do is bring in your empty containers to the centre, at the kiosk, enter 604-205-0058. (Striders Account #) and the number of bags of recycling you have, stickers will be printed and you stick them to your bags. The Burnaby Striders account will be credited for all returned items. Please feel free to share this message with your family and friends too! We are also actively raising funds through the sale of the World Famous Continental Almonds. We are looking for support from all members to help sell our cases of chocolate almonds to their families & friends! Cases come with 30 individual $2 boxes (30 x $2 =$60 per case). Incentive prizes will be awarded to the Top 3 Sellers! 2018 BC Summer Games Zone Trails May 26-27! For those born in 2003 and 2004 ONLY, Burnaby Zone Trails for the BC Summer Games is being held from May 26-27, 2018 at South Surrey Athletic Park at 14600 20th Avenue, Surrey, BC. 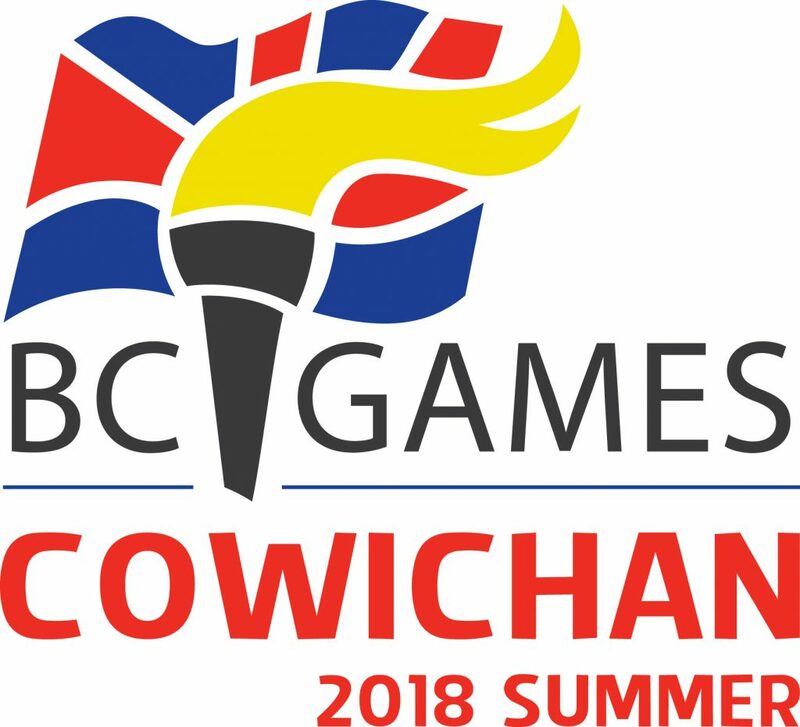 For those that qualify, the BC Summer Games will be held in Cowichan Valley from July 19 – 22, 2018. More event information can be found on the BC Athletics website. ZONE 4 includes major centers like Burnaby, Coquitlam, New West, PoCo, Port Moody, Surrey & White Rock. If you do not live in these areas, please visit the BC Athletics website to find out the right zone for where you live. Registration deadline is May 20, 2018 with cost at $15 per event for BC Athletics members. Late registration is $25 per event for members. This entry was posted in Uncategorized on May 8, 2018 by admin. Strong showing for the Juniors! 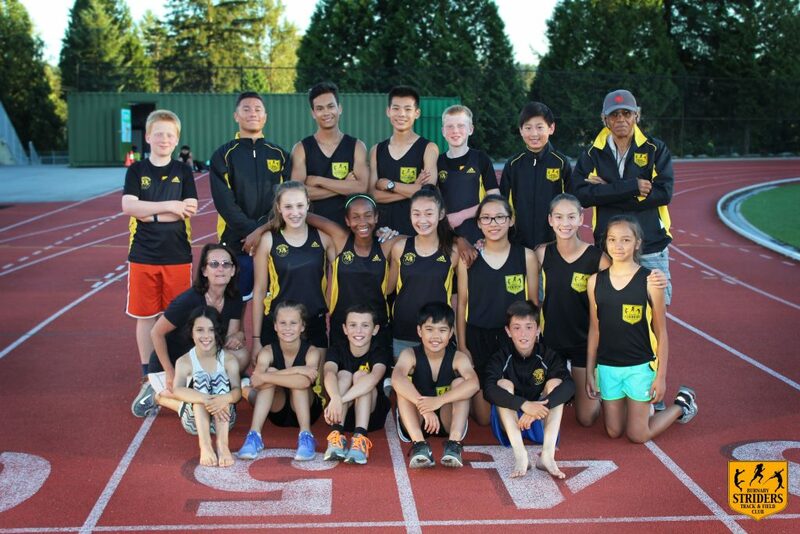 Our Juniors had a very strong showing at our more recent Vancouver Olympic Club and NorWesters Elementary Meets! 19 athletes competed in over 12 events. Congratulations to Alec Brent, Ava Jackson, Ben Mackinnon, Denis Petcu, Joe Georgilas & Sarah Conlin for capturing podium finishes at the VOC and BIG congrats to Ben and Joe for getting GOLD in the 60 meter dash! Over at the NorWesters meet, congratulations to Sarah Conlin, Joe Georgilas, Alec Brent, Max and Marisa Mazziotti and Stella Smith for impressive podium rankings. And again, special call out to Sarah for her GOLD in the 1000m and Joe for getting 4 individual GOLD medals! Check out the full results here! 2018 Kicks off with first Meet of the Year! 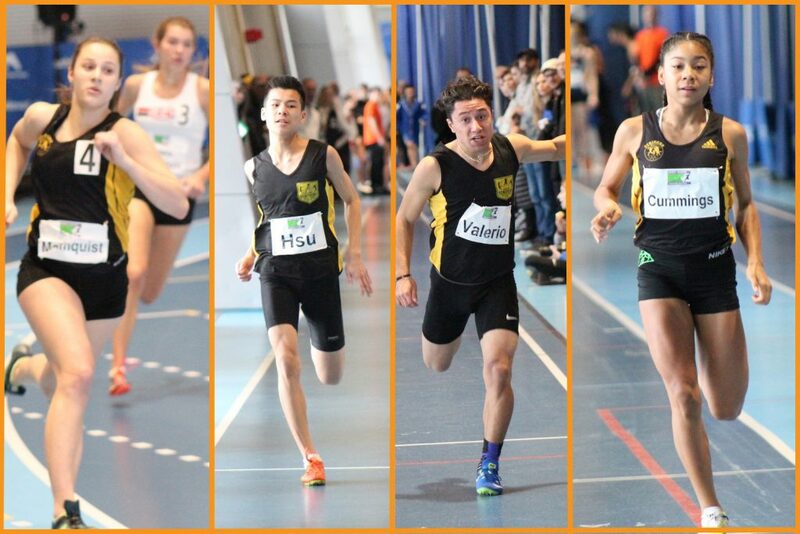 Striders athletes represented at this year's 2018 Harry Jerome Indoor Meet held at the Richmond Oval on Feb 3, 2018. Record attendance again this year with some of our athletes taking home medals. Both Jaeland Cummings and Brandon Hsu moved up into the Midget category (14 & 15 years old) with Jaeland capturing a Bronze medal with a new PB in the 60m dash at 8.31 sec and Brandon finishing with a 7.78 sec performance in the 60m. For the Youth - Julian Valerio, secured a Silver medal with a 7.50 sec 60m run and Katelyn Malmquist finished the 300m with a 45.47 sec time. Other Strider athletes included Sean Lee running a 7.68 sec 60m time and Shiloh Corrales Nelson capturing the Gold in the Shot Put with a 11.35m distance. For Full Event results, click here. Congratulations to our JD Athletes!! 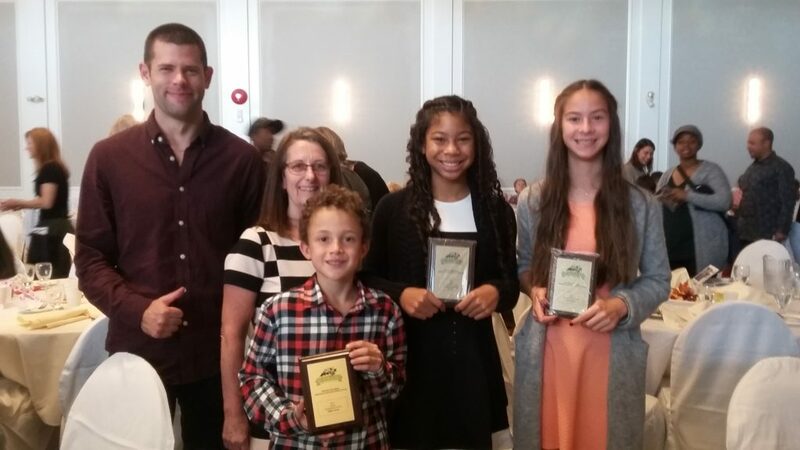 On Sunday, October 29th we had 3 athletes represent Burnaby Striders at the Junior Development Banquet! These athletes had an amazing 2017 season and should be extremely proud of their accomplishments! Huge thank-you to Coach Barb and Coach Chris who worked with the athletes on their development! Congratulations to Elijah Clarke, Jaeland Cummings and Ava Jackson!! This entry was posted in Uncategorized on November 3, 2017 by admin. Congratulations to all our Striders Athletes for a fantastic season! We hope everyone enjoyed their experience this past season and we look forward to resuming our indoor practices in early October! Huge thank-you to all our parent volunteers throughout the year, your assistance is truly appreciated! We have some fun team building and fundraising events planned for September....stay tuned for more details! Until then.....enjoy the rest of the Summer!! Welcome to the Burnaby Striders! 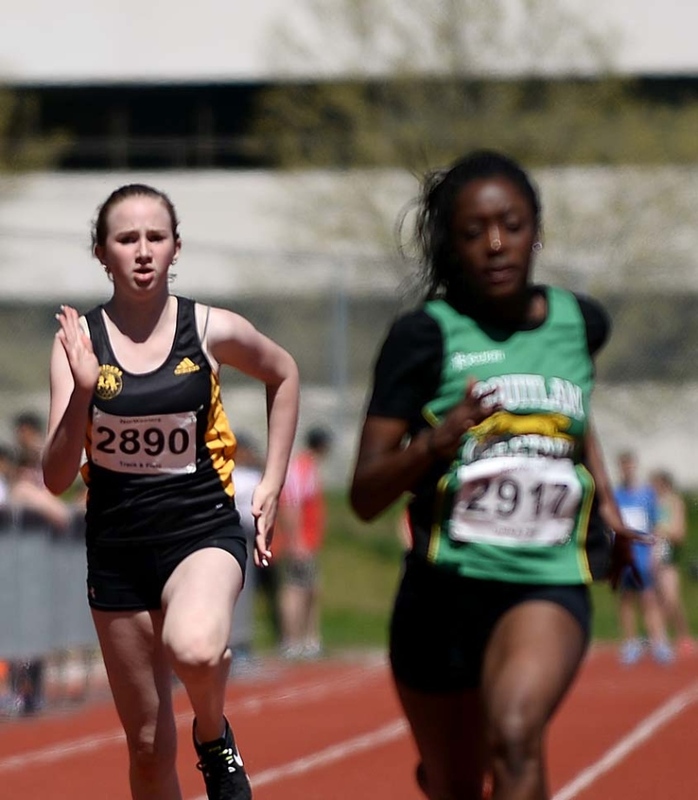 Home to Burnaby's track and field stars 9 years and up. Join the club to achieve your greatness! Spring Training Kicks Off April 1, 2019! 2019 Kicks Off @ Harry Jerome Indoor Meet! Shiloh Corrales-Nelson Signed with University of California – Riverside! Congratulations to Joe @ the 2018 BC Athletics JD Award Banquet! Striders featured in Burnaby NOW! Striders in full swing at Jesse Bent!